With Apple’s new streaming service likely to debut next Monday, 3/25/19, Apple has announced new iMac and iPad models and here at Connectech we’re very excited to fill you in on these new 2019 model devices. 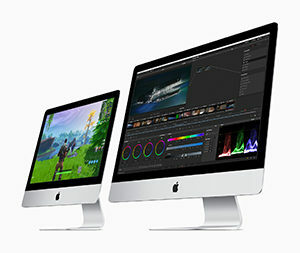 First there is a new iMac line with up to 8-core Intel 9th-generation processors for the first time and powerful Vega graphics options increasing compute time dramatically with the 27-inch iMac. The 21.5 inch iMac now features 8th-generation quad-core, and for the first time 6-core processors, delivering up to 60 percent faster performance. Radeon Pro Vega graphics come to the 21.5-inch iMac, delivering up to 80 percent faster graphics performance and the 27-inch iMac with Radeon Pro Vega now delivers up to 50 percent faster graphics performance. These iMacs come with the gorgeous Retina display in either 4K and 5K. The new 21.5-inch iMac with Retina 4K display starts at $1,299 (US) and the new 27-inch iMac with Retina 5K display starts at $1,799 (US). Apple, at the standard 10-inch size, has announced a new 10.5-Inch iPad Air with the current A12 Bionic Chip and Neural Engine (same as offered in the iPhone Xs and Xr) that delivers a 70 percent boost in performance and twice the graphics capability with a Retina display with Apple Pencil support. The new 10.5-inch iPad Air starts at $499 (US) for the Wi-Fi model and the iPad mini starts at $399 (US) for the 64Gb Wi-Fi model. 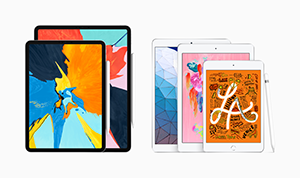 Apple also introduced the new 7.9-inch iPad mini, a major upgrade for iPad Mini, with the A12 Bionic chip, advanced Retina display, with Apple Pencil support. Both the new iPad Air and iPad Mini have gorgeous front and back facing cameras able to capture clear and stable 1080p HD videos. With more than 1.3 million apps designed specifically for iPad — from journaling with Apple Pencil to managing schedules and finances, editing photos, learning, connecting with friends and family, and playing games, these apps designed for iPad run and look great on every iPad.